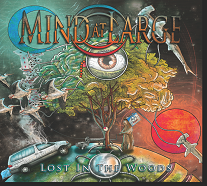 Mind at Large writes their music with the intention of creating something new. We are greatly influenced by our fore-rock-fathers, but strive to create our own sound. We can keep you on an upbeat groove and suddenly blindside you with an interesting bridge. Our goal is to stay true to our rock roots, with screaming, intricate leads complimenting the powerful and poetic vocals. We love to bounce our rhythm around to create many new feels throughout our songs. Each song embraces the emotion felt in that place and time. With movements ranging from dreams, the feeling of home, peace, partying and everything in between, it’s hard to get bored. Their debut album, Lost in the Woods sends you on an unplugged journey through the outer world of rock and grungy psychedelic movements with smooth licks and powerful vocals. Allow us to groove you along, pick you up and drop you back to a new reality.